A serendipitous beginning to our 2018 Circumnavigation of the Baltic: the story of our 2018 journey around the Baltic begins on the Harwich~Hook of Holland Ferry with another of life's strangely bizarre coincidences: the neighbouring passenger whom we asked to take the trip's official launch photo (see left) turned out to be exactly the same Dutchman, Jan Hardlooper, who had taken our photo on the same occasion last year at the start of our Faroes~Iceland venture! The Blessed St Serendipity was truly at work that evening, and what an omen to mark the beginning of this year's trip. We send our greetings to Jan, a like-minded fellow-traveller who was returning home after a walking holiday on the Welsh coastal path. 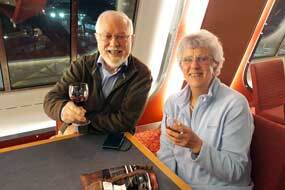 Acknowledgements to valued friends: our 2018 trip around the Baltic is the 21st such major European venture we have undertaken since we began long term travelling in 2004. Our VW T4 Campervan, known to us as George, and our home while travelling, has now clocked up 140,000 miles, and this year celebrates his 16th birthday. He owes his longevity and fitness for such extended journeys to 3 particularly valued friends, to whom we now make grateful acknowledgement for their help and support over the years: Myles Jackson of Foremark Garage, Oakham (01572 757254) skilfully takes care of George's engine and mechanical servicing; Frank Williams and his service engineer Paul Coldrick at Cotswold Motor Caravans Gloucester (01452 857131) creatively maintain George's living quarters; and Gavin Wilkinson of Highmeres Auto Services Leicester (0116 232 3242) with superlative craftsmanship keeps George's bodywork looking young and beautiful. If you want the very best care and attention in maintaining your campervan, we thoroughly recommend contacting these companies; from our personal experience, they will give you assured, personal and skilful service in their respective fields of expertise. The journey begins at Lübeck: it's a 380 miles drive from Hook of Holland across Netherlands and Germany to Lübeck, which was to be the pivotal point for our Baltic Circumnavigation. 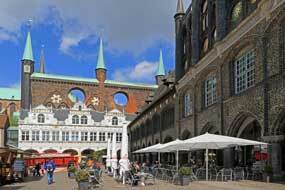 Lübeck was once the flag-ship port-city of the Hanseatic League whose trading empire ruled a pan-North European sphere of control across the Baltic from the 12~17th centuries. 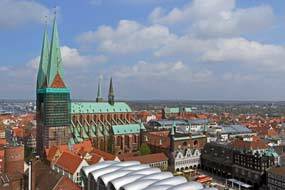 Lübeck's mercantile independence from the Church made it the wealthiest and most powerful of the 200 member cities of the Hanseatic League trading cartel through its monopolistic control of Baltic salt export. This mercantile wealth found expression in magnificent civic and ecclesiastical architecture still to be seen today despite damage from WW2 bombing raids. Our base for the visit to Lübeck was the ever-welcoming Campingplatz Schönböcken in the city suburbs, and at this early stage of the year, the campsite was remarkably peaceful. With the evening sun still warm, we were able to sit out for chilled Krombacher beers after today's long drive (see above left). Our visit to the port-city of Lübeck: in hazy sunshine the following morning we caught the #2 bus into Lübeck Altstadt (Old Town), and crossed to the gardens fronting the Hanseatic city's iconic Holstentor medieval city gateway. 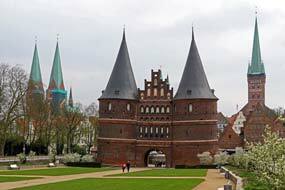 The chunky twin towers topped with conical turrets lean every-which-way from subsidence, and are linked by an arched lattice of stepped gables built of Lübeck's trademark red brick (Photo 1 - Lübeck's Holstentor city gate) (see above right). Following back lanes steeply uphill from the river, we reached the elegant medieval Petrikirche; with its 5 naves and slender spire, the red brick church built in the 13th century is now restored after being severely damaged along with much of the Old Town when the RAF targeted Lübeck in 1942in the first bombing raids on German cities. Lift access to the 50m high spire gives magnificent panoramic views across the Altstadt to the Holstentor and River Trave (see above left) (Photo 2 - Holstentor and Trave River), and the stately Gothic Marienkirche towering over the market place and magnificent Rathaus (Photo 3 - Marienkirche) (see right). Back down at ground-level, we walked over to the Markt to amble around the stalls to buy our supper. The market place was overshadowed by the towering flying-buttresses and spires of the Marienkirche, the imposingly decorated, starkly white façade of the medieval Rathaus with its conical topped turrets, and the adjoining 14th century Langes Haus and Neuen Gemacht (New Chamber) which served as the assembly hall for the Hansetag meetings of the Hanseatic League city ambassadors (Photo 4 - Rathaus and market place) (see left). Start of our journey along Germany's Baltic coast with a visit to Wismar: the following morning, passing through Lübeck's industrial northern suburbs, we set course along Route 105 parallel with the Baltic coast for Wismar, and part-way crossed the West Germany/GDR former border (click here for detailed map of route). It is worth recalling that from this point, until we cross to Helsinki in 17 weeks time, our route will be passing through what, until the re-acquisition of freedom in 1991, were countries under Soviet control and oppression. With the sky grey and air chill, we drove into the cobbled central area of Wismar, and managed to find parking in the shadow of the 80m high Marienkirche tower, all that survived of the former church, which was destroyed in one of the last RAF bombing raids of WW2 in April 1945. 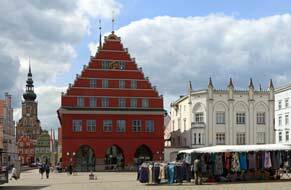 Wismar managed to retain much of the red-brick medieval architecture and town planning from its 13~15th centuries period as another leading Hanseatic port-city, particularly the monumental Gothic churches which reflect the town's medieval mercantile wealth. 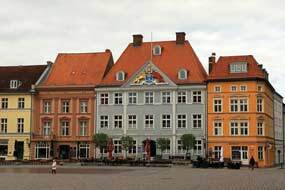 But in 1632, the city was occupied by the Swedes during the 30 Years War and Wismar came into the possession of the Swedish Empire under the 1648 Treaty of Osnabrück, and remained under the Swedish Crown ruled over by Swedish Royal Tribunal, until 1803 when Wismar was finally returned to the Duchy of Mecklenburg. 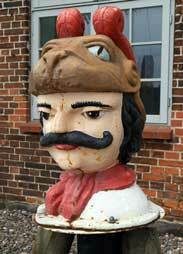 A legacy of Wismar's Swedish heritage can still to be seen today in the colourful moustachioed Swedish Heads scattered through the old town (see below left); the originals of these busts of Hercules most likely once stood on mooring posts marking the navigable channel at the harbour entrance. 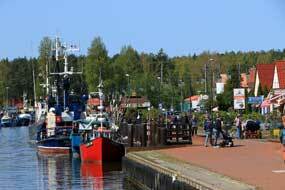 Since German re-unification in 1990, Wismar has been much restored and is now a popular tourist centre. 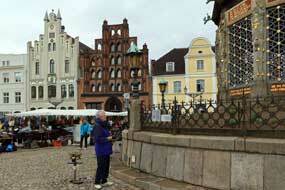 The weather today was as gloomy as on our first visit to Wismar in 2011. We walked around the Marktplatz, buying smoked fish for our supper from one of the market stalls, and photographed the medieval Gothic gabled Alte Schwede (Old Swede) burgher's house and ornate late 16th century Pumping Station which supplied drinking water to the city until 1897 (see above left). We walked down past the attractive gable-fronted town houses to the 13th century Grube canal to find the bulky red-brick Gothic St Nikolai Church with its 37m high nave which managed to survived wartime bombing intact (Photo 6 - St Nikolai Church). Along the canal, we reached the waterfront at the Alter Hafen, and the magnificent timber-framed red-brick Brauhaus built in 1452, one of the medieval breweries for which Wismar was famed. 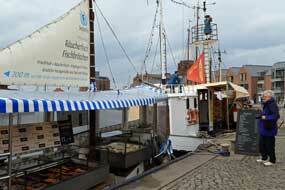 Fish stall boats selling tempting-looking smoked fish lined the harbour-front (see above right) and the distant Marienkirche towered over the town (Photo 7 - Wismar fishing harbour) (see above right). At the far end of the quay we reached the Baumhaus, an 18th century Baroque turnpike building which once guarded the harbour entrance, now decorated with 2 of the Swedish Heads. We returned o the town up Neustadt past more gabled town houses, to the monumental Gothic red-brick Church of St George, begun in the early 14th century and completed in 1594. 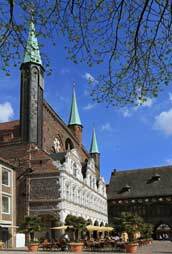 The church's bulky scale is testament to the wealth of the Hanseatic merchants and craftsmen who funded its construction. The structure was also badly damaged by WW2 bombing and is now being restored. Just along from here, we found the Fürstenhof (Princes' Court), completed in mid-16th century in Italian Renaissance style (see below right). 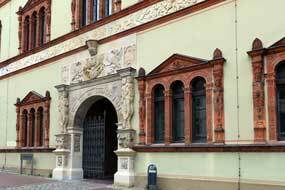 The exterior is richly decorated with ornamental sculpted and terracotta relief panels. Originally the seat of the Dukes of Mecklenburg, the building housed the governing Royal Tribunal following the ceding of Wismar to the Swedish Crown in 1648. Börgerende Camping on the Baltic coast near Bad Doberan, a place to be avoided: Route 105 took us 50 kms further along the Baltic coast to Bad Doberan where we turned out to the coast for tonight's planned campsite, Börgerende Camping. At the 5-star marble-floored reception, we waited for the surly girlie to emerge from her oh-so-important paperwork to deign to serve us; after all we were merely paying guests. Despite the exotically over-exaggerated claims of its glitzy website, such indifferent non-welcome characterized this ghastly, over-expensive holiday-camp; the vast shore-side expanse of camping area, crammed full of 5-star statics, was not for the likes of mere over-nighters who were shunted off into a tarmac compound stellplatz. Weary after a long day, we had no option but to settle into a corner to shelter from the chill Baltic wind now blowing. And to cap it all, the low season price for this miserable environment was an outrageous €27 (€34 in the summer season!) Börgerende Camping is clearly a place to be avoided by civilised campers, and will certainly rank high among the trip's worst campsites. Stralsund, another of the Hanseatic ports: it rained all night, and was still raining this morning when we set off through back lanes into the suburbs of Rostock, another former Hanseatic port but not a pretty sight with its grimly grey blocks of communist era panelaky apartment blocks. In heavy traffic, we passed under the river by toll-tunnel joined the highway which encircles the city, and turned back onto Route 105 heading towards Stralsund. Road closure for upgrading Route 105 caused a long and winding diversion through the back lanes of the former rural GDR before we were eventually able to join the A20 motorway and pick up speed towards Stralsund. Our original plan had been to cross to Rügen, Germany's largest island off its Baltic coast, settle at Sund Camping on the far side of the sound, and catch the little ferry over to Stralsund for the afternoon. But with time lost by the diversion and the high wind and miserable weather, it seemed more sensible to head directly into Stralsund Just before the elegant new suspension bridge therefore, we turned off into the historic port-city. 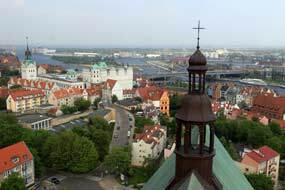 The distant silhouette of its Gothic churches gave a hint of the port's former mercantile wealth, rivalling more acclaimed members of the Hanseatic League. Uncertainly we edged along though the industrial suburbs and the narrow cobbled streets past Stralsund's modern port, and across a canal beyond the fish market, managed to find a paying car park close to the heart of the Altstadt. 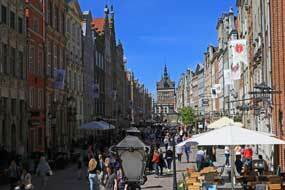 Just uphill, we emerged into the grand open space of the cobbled Alter Markt. 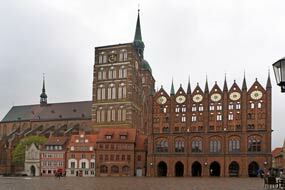 Stralsund's Altstadt proclaims its historic wealth as a member of the medieval trading cartel. 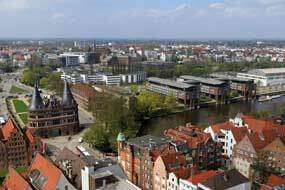 During its 14th century heyday, the city stood only second to Lübeck in the prosperity of its merchant guilds who have left a lasting legacy of grandly monumental Gothic red-brick buildings in the Altstadt (see left). Foremast among these, the twin civic assemblage of the mighty St Nikolai Kirche and show-case Rathaus line the western side of the Alter Markt (Photo 8 - Stralsund Alter Markt) (see above left). With the weather gloomy with drizzling rain, we garnered a street plan from the tourist office, and took our photos across the cobbled square of the civic church and town hall. The ornate Rathaus represents the apogee of medieval Gothic red-brick decorative architecture, with its stage-set façade standing precariously proud of the main building, and bristling with pinnacles, turrets and open rosettes to let through the Baltic winds. Subsequent to the Rathaus' medieval construction, the following period of Stralsund's Swedish occupation added further Baroque embellishments to the structure, with a galleried internal courtyard featuring carved columns and impressive side portal. In gloomy light this led us through to the magnificent Gothic side doorway of the neighbouring St Nikolai Kirche. The structure of lofty 14th century Gothic nave is now eclipsed by an extravaganza of ornate Baroque furnishings and adornments which, even in church's gloomy interior, dazzle the eye. St Nikolai's was the city council's official civic church adjoining the Rathaus, and many of the ornate altars donated by wealthy guildsmen survive from the medieval and Baroque periods. 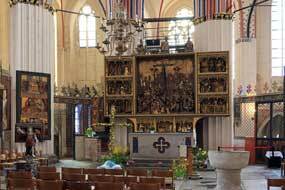 Foremost among these are the early 18th century Main Altar and 1480 High Altar (see above right). 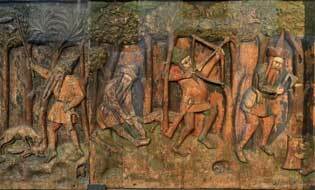 But more interesting for us than all these over-ornate features was an unassuming pair of carved wooden panels from the Pew of the Novgorod Traders. 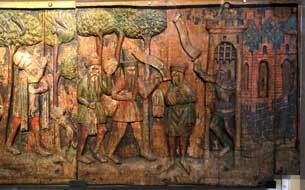 The engraved figures depict Russian hunters shooting squirrels for furs and tapping pine trees for pitch-tar (a valuable commodity for caulking wooden ships) (see above right), and selling their produce to a Hanseatic Merchant (see above left). 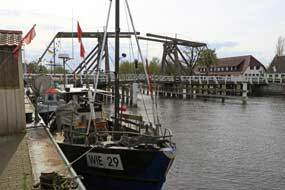 Sund Camping on Rügen Island: having bought our supper of more Baltic smoked fish at the Fische Halle, it was time to extricate ourselves from Stralsund's Altstadt. We turned back through the maze of cobbled streets, but then the way forward was blocked by an unmoving freight train from the docks parked across the road! Taking an alternative route, we caught up with the freight train and were delayed again. Ahead the new suspension bride towered over us, but the road from Stralsund over to Rügen crossed the lower old bridge. The road onto it however was blocked by an unchanging red traffic light with the lifting bridge raised to let a boat pass through the sound. Despite all these obstacles, we eventually managed to cross onto Rügen and turned off to the village of Altefähr on the far side of the sound to find Sund Camping. 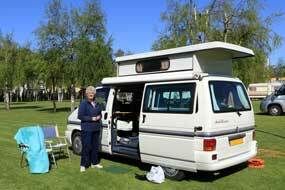 We had memories from our 2011 stay of a pleasant and welcoming campsite, but things had changed with most of the spaces now taken up with statics. With the evening gloomy and drizzly rain beginning, we settled into a sloping pitch to make the best of it. Rügen Island, Sassnitz ferry port, and a walk to Königstuhl chalk cliffs in Jasmund National Park: as so often happens, the dark, gloomy campsite seemed so much brighter on a sunny morning (see above right). We learned from the rather taciturn campsite owner that the Stralsund ferry did not start its seasonal working until the beginning of April, so it was just as well we had driven directly into the city yesterday afternoon. 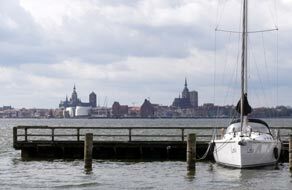 After a pause at the Altefähr ferry port for the view across the sound to the distant silhouetted outline of Stralsund's churches (see left) (Photo 9 - Stralsund's churches across sound), we turned northwards on Route 96 for our day on Rügen (click here for detailed map of route). 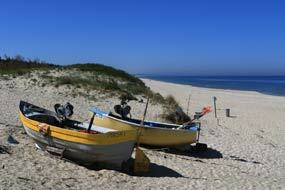 The island has been a traditional German holiday venue since 19th century Romantics eulogised its natural beauty. Bismarck and the Kaisers relaxed here, and Hitler chose Prora on the north coast to build a monumental concrete resort accommodating 20,000, as part of the Nazi Kraft durch Freude (Strength through Joy) movement in preparation for military expansion eastwards. Under the GDR, Eric Honecker and millions of East German workers took holidays on Rügen, and their caravanning successors still flock to the coastal resorts. Initially we made good progress across southern Rügen, but soon the dreaded Strabag sign warned of roadworks where the continuation of the E22 was still under construction, and traffic to Sassnitz was diverted to the old road. It was clear from number plates that all traffic was local with few tourist about at this time of year. But at Sassnitz, the ongoing road to Jasmund National Park was entirely closed by roadworks; only at the TIC did we establish an alternative route through rural villages around the far side of the Jasmund peninsula eventually to reach the parking area for the Jasmund National Park. The island's natural beauty is best seen in the woodland-covered peninsula which ends at the startlingly white chalk cliffs of the Stubenkammer. With all the delays and diversions, we should only have time today for the 3 km footpath which leads through delightful beech woods to the highest point of the cliffs, the Königstuhl (King's Stool), a 350 feet high chalk buttress projecting from the north coast line of chalk cliffs. With the sun now bright with a breeze to keep temperatures cooler, we set off at a brisk pace. As we entered the beech woods, the ground was covered with a carpet of last years dead beech leaves and this year's White and Yellow Wood Anemones (see above left), so redolent of Springtime in the Ålands and Southern Scandinavia (Photo 10 - White Wood Anemones). The path threaded an undulating way through this delightful woodland; sunlight filtered down through the tall beech trees picking out the fresh green of new leaves (see above right). 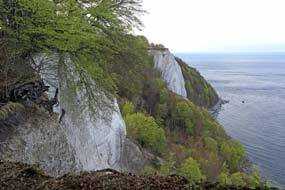 This was certainly the time of year to visit the Stubenkammer cliffs, with late April sunlight and woods path deserted. Not prepared to pay rip-off admission charges for the Königstuhl look-out point, we followed the cliff-top path to Victoria Sicht high-point which gave a magnificent view of the 120m high startlingly white chalk cliffs with their sheer drop down to the grey waters of the Baltic. The last light of the late afternoon sun caught the Königstuhl prominence (see above left) (Photo 11 - Königstuhl chalk cliffs), and lit the emerald green of new leaf on the beeches lining the cliff tops. The wooden steps leading down the 300 feet, which we had descended in 2011 to the shingle beach below the chalky cliffs, were now closed because of rock falls. This had been a thoroughly rewarding couple of hours walking, and we caught the bus back to the parking area. 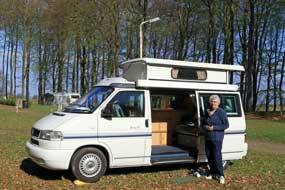 Krüger Natur-camping in Jasmund National Park: just along the lane at Hagen village, we reached Krüger Natur-camping. With the large site's camping areas almost empty, we selected a pitch in the deserted beech woodland (see left). Darkness fell early in our woodland grove and a half-moon rose above the tall beeches. The following morning, a bright sun lit our beech wood camp, but the inadequacies of the campsite's facilities, some antiquated, others still being built, and scattered over a wide area, became even more evident. The Hanseatic port and University city of Greifswald: the return drive across Rügen entailed another scenic tour of rural back-lanes to bypass the closed roads, but we eventually emerged to re-join Route 96 and the new E22 motorway to cross the high-level Stralsund suspension bridge to the mainland. Route 105 around the Baltic coast brought us to Greifswald, another of the former Hanseatic port-cities (click here for detailed map of route). The town did not have the wealth and grand edifices of the trading cartel's bigger members, but it did develop as an academic centre with one of North Germany's oldest universities founded in 1456 which developed during the Swedish period of occupation. 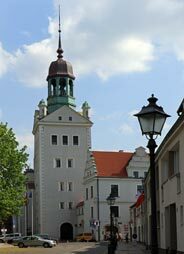 The town's charming ambience was recorded by local artist Casper David Friedrich in the early 19th century, and the historic buildings and grid pattern of streets of its Altstadt survived WW2 relatively unscathed thanks to the German military commander surrendering the town to the Red Army in 1945. In the outskirts, we pulled into a shopping complex and luxuriously stocked hypermarket for a provisions stock-up, and along the estuary found a car park close to Greifswald's old centre whose churches were silhouetted against the skyline. We crossed the footbridge past the old boats moored along the river, and walked through streets lined with pastel-coloured, gabled fronted buildings to the central Markt. 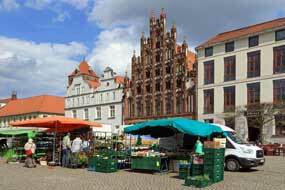 The town's market place was filled with vegetable, flower and fish stalls, and backed by the maroon-painted gabled Rathaus (see above right). 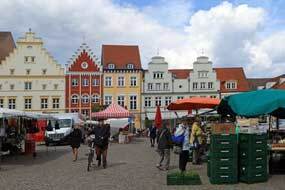 One side of the square is dominated by 2 Hanseatic period wealthy merchants' houses, the more elaborate having a turreted red-brick gabled Gothic frontage patterned with a latticework of lancet arches (Photo 12 - Greifswald Market Place) (see above left). The stubby tower of the Marienkirche rose above the houses on this side of the Markt, the oldest of Greifswald's 3 churches built to celebrate the port's joining the Hanseatic League in 1250. A third side of the square is lined with more modestly gabled, pastel-painted town houses (see left). We ambled along the modern shopping street of Lange Straße to find the parish church of St Jakob, a bulky red-brick edifice, and along from here passed the Baroque frontage of Greifswald's Ernst-Moritz Universität, and named after its Swedish financier benefactor. Opposite, in a small tree lined park, a Neo-Gothic memorial recalled the University's founder Swedish King Frederick I. Just beyond we reached the Dom St Nikolai, another enormous Gothic red-brick church with high turreted spire decorated with Baroque baubles (Photo 13 - Greifswald's Dom St Nikolai). Despite restoration works on the external structure, we were able to see the unadorned white Lutheran interior where the organist was giving full vent to the cathedral's mighty organ. Greifswald's port of Wieck: 4kms along the estuary from Greifswald, the town's picturesque fishing port of Wieck fishing port of stands at the outflow of the Ryek River. Down past the thatched cottages, the riverside dock was lined with fish smokeries where we could buy more suppers of Baltic smoked forelle (trout) and saibling (char). 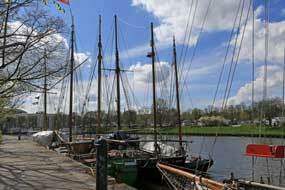 The port's working boats were moored along the river which was crossed by a wooden Dutch-style lifting bridge (Klappbrücken) creating a beautiful setting (Photo 14 - Lifting bridge at Wieck) (see right). Campingplatz Waldcamp Freest on the Baltic Coast: through modern Greifswald in busy early evening traffic, we followed the coastal road out to Lubmin passing a GDR period industrial complex and power station, to reach Campingplatz Waldcamp Freest set among the pine woods of the Baltic coast. First impressions suggested a large site with fewer statics and huts than expected, and we were greeted hospitably by the lady-owner. The price was €22.50/night, facilities were clean, modern and well-equipped, and we selected a pitch in the far corner of the large camping area looking out to the Baltic. As dusk fell, the evening grew chill, lights twinkled on the distant coastline of Usedom where Peenemünde was located, and we cooked supper of Wismar smoked salmon with green asparagus. The following morning the still air and warm sunshine enabled us to sit outside for breakfast looking out over the estuary towards Usedom (see left), our venue for today. Campingplatz Waldcamp Freest had been a very pleasant stay. The WW2 secret military rocket research station of Peenemünde: a rural lane along the estuary brought us to the nearby town of Wolgast where we crossed the lifting bridge over the straits which separate the island of Usedom from the German mainland (click here for detailed map of route). The narrow, 50 km long island had been an aristocratic playground in the 19th century, and the GDR communist authorities had confiscated resort properties turning Usedom into a mass workers' holiday resort. Since re-unification, entrepreneurialism has reasserted itself and Usedom's miles of fine white sand beaches are again a magnet for mass tourism. But what happened here in the late 1930s and in WW2 gave us an entirely different reason for visiting a place whose holiday-making preoccupation would normally have repelled. The isolated western tip of Usedom was the location of Peenemünde, the German secret military rocket research station, set up in 1936 under Wernher von Braun (see right) to develop the liquid fuel A4 rocket. The Nazi's aggressive re-armament programme guaranteed limitless funding for rocket research to provide more powerful military ordnance. Von Braun's design team had to develop a large liquid fuel engine for the rocket's thrust, and supersonic aerodynamics and gyroscopic guidance systems to control stability in flight. 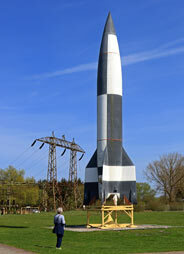 After endless failures, the first successful launch of the A4 rocket took place at Peenemünde in October1942, the first ever breaching of the space barrier. Initial reports of rocket development at Peenemünde were rejected by the Allies as disinformation, but aerial reconnaissance photos of the site showing the presence of tube-like objects were finally interpreted as rockets. 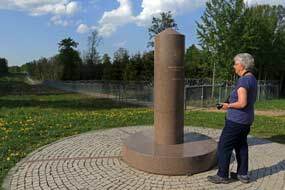 A massive 500 aircraft RAF attack caused devastation at Peenemünde and in 1943 production of the rockets was moved to an underground factory complex, Mittelbrau Dora, in the Hertz Mountains using concentration camp slave labour. With the 1943 defeats marking WW2's turning point, the continuing intensive RAF/USAAF bombing of German cities, and the 1944 D-Day landings, Hitler needed a 'wonder weapon' to restore German morale. In mid-1944, he ordered attacks by 'Vengeance Weapons (Vergeltungswaffen) against the cities of Western Europe and London. Initially V1 flying bombs launched from fixed 'ski ramps' along the channel coast attacked London then in September 1944 attacks by V2 rockets began from fixed launch sites then from mobile launch platforms. Some 20,000 V1s and 7,000 V2 rockets were launched. Their inaccuracy made them ineffective against precise military targets; they were used purely as vengeance terror weapons against areas of dense civilian population. The slower V1 flying bombs were vulnerable to counter-attacks, but there was no defence against the speed and trajectory of the V2 rockets which fell from an altitude of 110 kms at 4 times the speed of sound (3,500 kms/hour). The V2 rockets were powered by a mixture of liquid oxygen and alcohol with the temperature of the engine's combustion chamber reaching 2,500°C causing the long plume of exhaust flame. From launch, the rocket motor burnt for 65 seconds propelling the rocket to the boundary of space; after the engine's cut-out, the rocket continued in a free fall ballistic trajectory to reach its target range of 320 kms in 3 minutes. The 1 ton explosive war head caused 20m wide, 8 m deep craters. 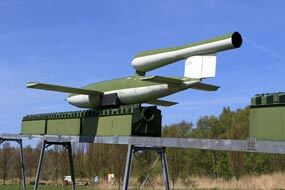 Despite attacks by V1s and V2s on London, Antwerp, Lille and Paris causing some 3,000 civilian deaths, their military impact was minimal given their cost and vast consumption of scarce materials; it was said that the V2 rocket killed more people in its production (20,000 slave labourers) than in offensive deployment. It was, exactly as its name implied, a 'Vengeance Weapon'. Against this historical background, we turned north along the wooded spine of Usedom through the holiday-making villages of Trassenheide and Karlshagen. Both places had been the site of barracks for troops and scientists and camps for slave-labourers during Peenemünde's wartime experimental rocket station years, but now were filled with holiday homes. Continuing ahead through the sandy heath-land pine forests, following the railway line which once transported labourers and materials to Peenemünde, we finally reached Usedom's western tip and the surviving red-brick steam-driven power station of the 1930~40s German secret military rocket station which now houses the Peenemünde Historical and Technical Museum In front of the building a replica of the enormous A4/V2 rocket stood on its launch stand (Photo 15 - V1 flying bomb) (see above left and right) and alongside the V1 flying bomb mounted on its 'ski ramp' from which it was launched by steam-driven piston catapult until its thrust jet motor had reached the 370kph for the bomb to maintain flight (see above left)(Photo 16 - V2 rocket). The museum's exhibits are spread over 3 floors of the former power station, relating in frank and objective details the the history of early rocket development in the 1930s and the WW2 period of successful launch, mass production of the V1 flying bombs rockets and V2 rockets using slave labour, and devastating impact of the vengeance attacks on civilian population. The ground floor displays continue the more fascinating post-war period of the A4/V2 rocket's story, when the US and USSR hijacked stocks of rockets and components together with the German scientists and technicians (including von Braun himself), to develop their own competitive military rocket programmes leading to the Cold War arms race, The displays celebrate the 50 years of space exploration since Yuri Gagarin's historic first space flight in 1961, leading ultimately to the multi-stage Saturn V rocket, a direct descendent of the V2 rocket developed by von Braun at Peenemünde, which landed Neil Armstrong on the moon in 1969. 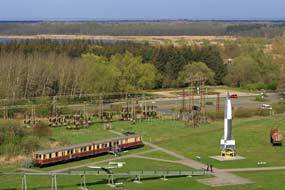 Since our first visit in 2011, the power station generator house had been opened as further museum space, with an elevator to a roof-top viewing platform giving panoramic views over the full extent of the Peenemünde rocket research station (see right). Without doubt the Peenemünde museum does relate the story of the unequivocal military purpose of German rocket development as vengeance weapons in frank and objective terms. 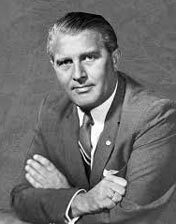 The myth of von Braun as the enthusiastic but gullible scientist is debunked in equally frank terms: he was a committed Nazi, an opportunist guilty of war crimes, while at the same time a brilliantly creative design engineer. The exhibition deals equally frankly with the barbaric German exploitation of slave labour in rocket production factories. Post-war American cynical hypocrisy in illegally granting visas to former Nazi war criminals, including von Braun himself, for use in the US' own rocket development programme is also given exposé. 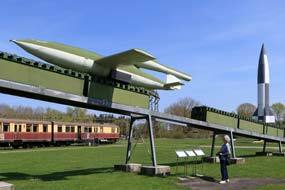 The Peenemünde museum presents a worthwhile exhibition with as much emphasis on the historical, political and moral implications of wartime and post-war rocket development as technical details. 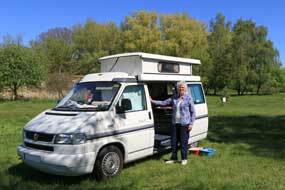 Into Poland and Camping Marina at Szczecin: on a quiet Sunday morning, we headed SE through the Spring green countryside on delightful rural lanes to approach the town of Anklam. Here we paused for bread at the attractive town square, before joining Route 109 through a series of villages to each the small town of Pasewalk (click here for detailed map of route), and turned off onto Route 104 towards the Polish border. German supermarkets are all closed on Sundays and we needed to shop for provisions; we hoped that shops would be open today across in Poland during the transition period (opening on only first and last Sundays of the month) to full Sunday closure introduced by recent legislation. 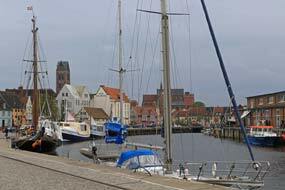 We had greatly enjoyed our Hanseatic week along German's Baltic coast, and had felt entirely comfortable in orderly German provincial society with its patient driving standards, courteously civilised behaviour and admirably first class public services. All of this was such a welcome contrast with contemporary UK, characterised now by loutish behaviour, aggressive driving, lack of any courtesy or good manners, abysmal public services despite ever-increasing taxation, and unbelievably incompetent, corrupt Tory non-government. Now suddenly we were pitched into Poland's impatient driving standards as we approached the outskirts of Szczecin (pronounced Shchetsin), formerly German Stettin before the 1945 shifting of borders. We pulled into an enormous shopping complex, its car park busy and full with Polish shoppers making the most of their retail freedom while Sunday opening lasted. After a week of German familiarity, initially we were bemused in the huge hypermarket with Polish names of foodstuffs. But we soon began recognising items recalled from our 2010 Polish trip and from the Polish skleps back home, and were pleasantly surprised at the check-out with low Polish prices. 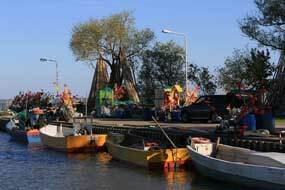 We now had to drive through the heart of the city to reach Szczecin Marina Camping in the eastern suburb of Dąbie, and were thankful traffic was light on a Sunday afternoon. Our sat-nav guided us faultlessly through the city centre, passing features recalled from our 2011 visit. Across the main channel of the Odra River, we headed out into the grim-grey eastern suburbs, past the sky-line of Szczecin's dockland cranes, to reach Marina Camping. Nothing had changed in the 7 years since we were last here: the campsite is set in neat parkland on the shores of the lake formed by the Odra estuary, with trim flower gardens, with excellent facilities, a small bar-restaurant and free site-wide wi-fi, excellent value price 70 Złotys/night for a small camper (£14), and most of all the wonderfully helpful hospitality with which guests are greeted at reception. 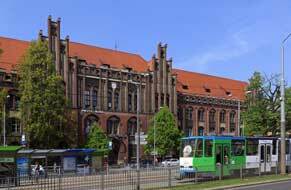 In fluent English, the lad provided details of the bus and tram ride into the city centre. Like many Polish campsites, it has a homely campfire circle with plentiful supplies of chopped wood and encouragement to light an evening fire. The campsite was quite busy, but we tucked ourselves into a secluded corner on the far side, screened by hedges from the offensive sight of German mega-buses and their obese occupants (see above left). The sun was fearsomely hot and we were glad of the trees' shade; it was still only April! As dusk settled, we enjoyed another barbecue, with the wood smell of a campfire wafting across the campsite in the warm evening air. 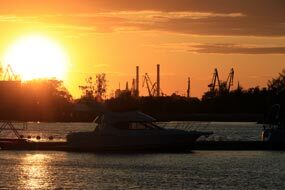 It was so good to be back at Szczecin Marina Camping, a truly first rate camping. Our day in Szczecin: with temperature forecast at 24ºC, we walked round to the bus stop just outside the campsite for our day in Szczecin (see above right). Tickets (valid on all public transport) at 2 Złotys each are now bought from an automat on the bus (1 Polish Złotys = 20p), and at Basen Górniczy, we changed to a city tram for the second part of the journey into the centre. 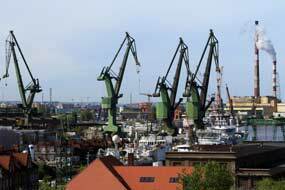 Szczecin is an unashamedly industrial city spread along the banks of the Odra with the cranes of its docklands showing its maritime and ship-building heritage. 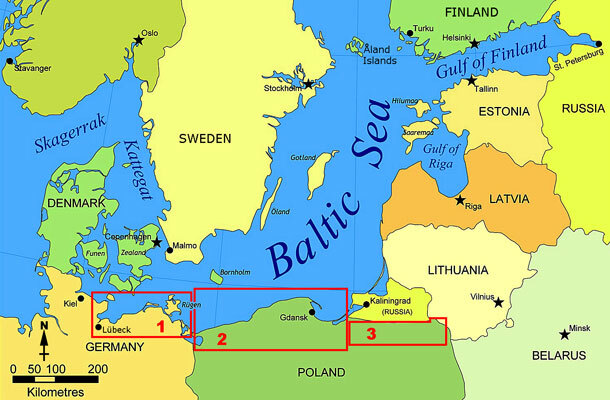 German colonists came to dominate the original Slavic settlement once the port-city joined the Hanseatic League in the 13th century, and it remained under Prussian/German control until the 1945 redrawing of Poland's borders. Many of Szczecin's medieval show-case buildings had been restored after WW2 damage, like the beautiful Gothic brick town hall or grandiose Castle of the Pomeranian Dukes. Despite the economic plight and unemployment resulting from change to post-communist market economy with closure of shipyards and associated industries, we formed the impression today that in the 7 years since we were last here, marked progress had been made with restoration of the severe damage suffered in WW2. The old town is now predominantly residential with the city's commercial hub shifted westwards away from the river to blandly grey boulevards. Just after crossing the Odra, we got off the tram at Wyszynskiego close to St Jakob's cathedral (see above right) (Photo 17 - Szczecin trams passing St Jakob's Cathedral), and walked back to the river for the views of the sun-lit restored Castle of the Pomeranian Dukes with its decorative white icing-sugar façade set on the hill above the city (see above right) (Photo 18 - Pomeranian Dukes' Castle). In the busy city traffic, we crossed to the Franciscan Monastery of St John, Szczecin's oldest building dating from the 13th century (see above left), distinctive for the geometric inconsistency of its medieval structure with irregular decagonal chancel and later nave abutting at an oblique angle with off-centre vaulting to align the bays with the aisle windows. As we walked towards the old centre towards the cathedral, we revelled in being back in Poland, renewing acquaintance with familiar words, signs and conventions. St Jakob's Cathedral is a huge Gothic red-brick structure, the oldest parts dating from the 14th century designed by Hinrich Brunsberg, the medieval master brick-work architect, was severely damaged in WW2 and even more carelessly over-restored post-war (Photo 19 - Szczecin's St Jakob's Cathedral) (see above left). We continued along Wyszynskiego, braving the furious traffic and passing trams to photograph the Brama Portowa (Harbour Gate), a pair of ornate Baroque gables linked by a hall, built by the Prussians in 1725 to symbolise their possession of what was then Stettin (see above right). Along the main commercial boulevard of Niepodłegłości, past the Prussian built 1905 Post Office (see above left), we found a straightforward little café for a hearty Polish lunch of thoroughly delicious Gołąbek (cabbage leaves stuffed with minced pork) and kaszca gryczana (buckwheat grains) (see right). Beyond the intersection of Plac Zołnierza Plskiego, we walked along the pleasantly shady parkland down the centre of the boulevard to the Gate of Prussian Homage (Brama Hołdu Pruskiego) whose central hall between its ornate gabled ends now houses a café, and crossed to the Pomeranian Dukes' Castle whose bell-tower rose above surrounding buildings (see left). The early Slav fortified settlement here was replaced in the mid-14th century by a more robust stone structure, the oldest section of the current castle, which was enlarged in 16th century Renaissance style and further remodelled in Baroque style in 1720. The Castle was flattened by Russian bombing in 1944 and has since been restored, now housing a museum. With the Castle's bell-tower disappointingly closed Mondays, we headed back to the Cathedral for its panoramic views over Szczecin's mix of scattered historic buildings set amid grim-grey Germanic inheritance and its historic dockyards along the River Odra. On the way, we peered in to the red-brick Gothic Church of St Peter and Paul's Church (another of Brunsberg's creations), and along Mariacka, passed the house that was birthplace in 1729 of the Russian Empress Catherine the Great who ironically played a leading part in the partition of Poland which wiped her country of birth of the map of Europe. In the small park of Plac Orła Białego near the Cathedral, we found the Baroque statue of Flora, and the White Eagle Statue which gives its name to the square, backed by the Baroque Pod Globusem Palace, which once housed the governor of Prussian Pomerania and is now a medical academy. Over at the Cathedral, we waited impatiently for the 2 harpies to finish their fag break so that we could take the lift up to the 56m high tower's viewing gallery. 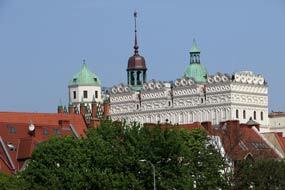 The panorama over the old city to the riverside docks was glorious, showing the extent of restoration that had been carried out after wartime damage, particularly the startling white decorated façade of the Castle taking centre stage (see right) (Photo 20 - Szczecin rooftops with Castle of Pomeranian Dukes). On our last visit in 2011, we had observed the number of empty plots between restored buildings still standing empty, work being delayed by financial shortages in the leaner years following Poland's transition to market economy post-1991. Today there were fewer such areas of incomplete work, and the city had a more affluent and less grim-grey air. Along past the magnificently restored Gothic gabled Old Town Hall, we sat for a beer at a bar-terrace at the Stary Rynek looking up at the decorously painted gabled burghers' houses lining the square (see left), before returning to Wyszynskiego for the tram back to the campsite at Dąbie. Early evening we walked along past the marina for sunset photos looking along the waterfront towards Szczecin's silhouetted dockyard cranes (see right) (Photo 21 - Szczecin silhouetted dockyard cranes). After a thoroughly enjoyable day in Szczecin, we were now feeling comfortably back in Polish society and more confidently using our limited Polish. Tomorrow we should enjoy a much needed day in camp at the excellent Marina Camping, after an intensive first week of travelling. 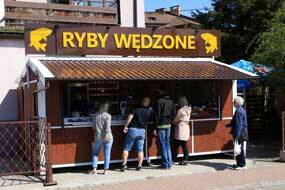 A day at the seaside and a welcoming campsite at Międzyzdroje: today we should move back to the Baltic coast of NW Poland at the seaside resort town of Międzyzdroje (pronounced Mee-en-jee-zdro-yeh). We headed north on the E65 motorway and Polish Route 3 (click here for detailed map of route) and crossed the Dziwna River onto Wolin island formed by the channels of the Odra estuary. Road signs pointed ahead to Ystad, Trelleborg and Malmö, puzzling until you realised they were to the port of Świnoujście and ferries to Sweden. We turned off into Międzyzdroje, expecting the little resort to be quiet at this early stage of the summer season, but forgetting that the 2 national holidays this week (May Day and Constitution Day) made this a popular holiday time for Poles. The centre of the town and sea front were busy with holiday-makers and the car parks were full, so we made straight for the municipal campsite to be welcomed with genuine hospitality by the ebullient warden (see left); he gabbled away in a mixture of Polish and German but managed fully to convey his meaning. You really could not have asked for a more kindly welcome. We settled in and walked along to the promenade. What would normally in early May be a sedately peaceful little seaside resort was today brimming full of Poles-on-holiday with all the paraphernalia to accompany it: sunhats, buckets and spades, cuddly toys, kids galore, the works, and all walking up and down the prom clutching ice creams and hot dogs from the garish stalls lining the sea front. We sought out the food stalls to treat ourselves to the long-promised lunch of flądra i frytki (flounder and chips) from one of the stalls along the front that we had so enjoyed on our 2011 visit. But each of the stalls we tried shook their heads - no flądra! It seemed too early in the year for this tasty flat-fish so characteristic of the Polish Baltic coast. Reaching the Międzyzdroje classic seaside pier, we had to admit defeat: we were not going to get flądra (pronounced flan-dra) today, and settled for sandasz i frytki (zander and chips); perhaps not the flądra on a paper plate we had expected, and slightly more expensive, the fish was delicious, crisply fried with a delicately sweet flavour. There was just time today to walk out to the Bison Reserve in the Wolińsky National Park forests on the outskirts of the town. Leaving behind the seaside hotels, suddenly we passed from bustling holiday-makers to peaceful beech woods, and plodded uphill through the woods to find the Bison Reserve. 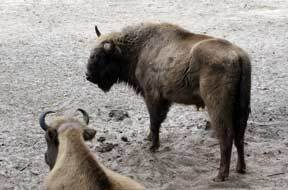 European Bisons were hunted to extinction in Poland during medieval times, but a small number have been brought here from the larger reserve at Białowieźa in Eastern Poland and bred here in captivity to conserve this species of shaggy beast. From a high viewing platform, we looked down on the 8 rather moth-eaten specimens lying lethargically on the bare earth of the compound, certainly not the best presentation of these magnificent beasts. Back down into the town through the holiday-making throngs along the prom, we walked out past the ice cream stalls along Międzyzdroje's pier for a look at the flat-calm grey Baltic, after a week of travelling along its coastline. 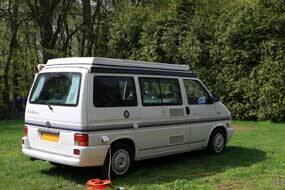 Today had been an entertaining interlude at this old-fashioned seaside town with its welcoming municipal campsite. Journey along the Polish Pomeranian coast to Łeba: today we should begin our journey along the Polish Pomeranian coast to Łeba (click here for detailed map of route), and the warden at Międzyzdroje Camping with his charmingly old-fashioned courtesy wished as a gute reise; he really was a lovely man whose kindly hospitality towards his guests set an example that others could do well to follow. With the road busy with holiday traffic, and with bright morning sun picking out the Spring green of new leaves on the trees, Route 102 wound its way through the beech forests and villages of Wolińsky National Park, finally crossing the exit channel of the Dziwna River at the seaside town of Dziwnów. Just beyond, the roadworks began and continued for over 20kms with a long series of stops temporary traffic-lights and slow progress through partially completed road re-surfacing. After a back-lanes diversion, we picked up Route 102 again at the village of Lędzin where we saw this year's first occupied stork's nest and a Catholic Calvary decorated for May Day. 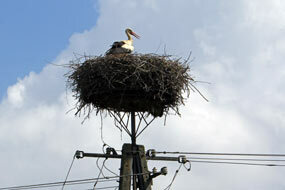 From this point, virtually every village had a nest with adult bird sitting on newly laid eggs. Having extricated ourselves from heavy traffic in the large town of Kołobrzeg, and passed through the holiday village of Ustronice Morskie, we followed Route 11 to Koszalin. Beyond the town, we left main roads to take Route 203 back out closer to the Baltic coast, past large coastal lagoons to the undistinguished holiday resort of Darłowo. Although traffic was less busy, Route 203 was a poorly surfaced minor road with constant potholes and sides badly worn, meandering across the coastal farmlands to the equally unimpressive resort of Ustka, where in 2011 we had witnessed the comically entertaining encounter of a Polish naval cutter with a pirate ship (no kidding!). No such memorable episode today, as weary from a long drive plagued by roadworks, wretchedly bad roads and aggressive Polish driving standards, we passed through the town heading for Słupsk, noted as the only Polish town with an openly gay mayor (another one for your next pub quiz night!). The final 70km stage of today's long and exhausting journey out to Łeba on the Baltic coast should have been a pleasant conclusion to the drive. It turned out however to be some of the most badly surfaced stretches of road ever experienced in many years of travelling, more a case of constant pot holes connected by occasional broken tarmac than surfaced road. The road was a disgrace, and harassed by aggressive Polish overtaking, we bumped along slowly through a final 12kms series of roadworks to delay us further. 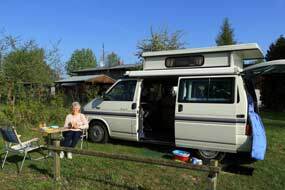 Lesny Camping at Łeba: it was 6-30 when we finally reached Łeba and pulled in to the gates of Lesny Camping to be received with welcoming hospitality by the son of the elderly owners we had met on our previous visits. 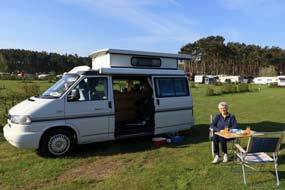 The next generation had taken over this lovely family-run campsite and had clearly maintained its +5 standard of excellence. 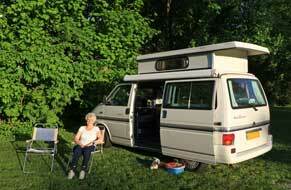 His elderly father showed us over to the lushly turfed camping area (see left) (Photo 22 - Lesny Camping at Łeba). 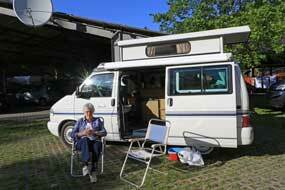 We had expected the site to be busy at holiday time, but it fact it was wonderfully peaceful. We were exhausted by what should have been a pleasurable journey along the Baltic coast of Polish Pomerania, but had turned out a journey from hell, memorable for all the wrong reasons (unrepaired, pot-holed roads, constant delays from roadworks, holiday traffic and aggressive Polish driving standards), so different from this nostalgic journey in 2011. But we enjoyed a relaxing evening at the delightfully welcoming Lesny Camping, and at 9-00pm the familiar notes of the Hejnał trumpet call sounded out from Łeba's church with the traditionally curtailed ending, said to originate when the watchman on Krakow church tower was shot by an arrow from the invading Mongols. The following morning in bright sunshine we sat out for breakfast on the trim lawns of Lesny Camping, before driving into the little port. Parking by the docks, we walked along past the moored fishing boats to buy more Baltic smoked fish from the fish stalls (see above left and right). 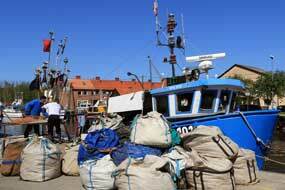 It was a lovely morning to amble round past the boats where fishermen were sorting nets (Photo 23 - Łeba fishing harbour). Continuing journey to Stogi Camping at Gdańsk: leaving Łeba to the holiday-makers, we faced the roadworks and damaged roads for the return drive to Lębork to join the main Route 6 to Gdańsk (click here for detailed map of route). We expected Route 6 to be highway standard for a rapid drive around past the Gdynia and Gdańsk conurbation, but speed restrictions, traffic lights and heavy traffic through a continuous series of built-up areas meant slow progress. Keeping one eye on the speedometer with continuous speed cameras, and the other on the heavy traffic, we turned off to a Tesco hypermarket near to Gdynia for a provisions stock-up. Re-joining the highway, we continued south, grateful for our sat-nav's reassuring guidance through the motorway network around Gdańsk. 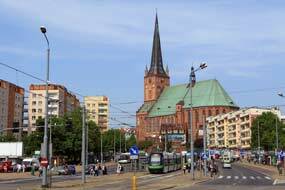 Passing by the city centre, recognising landmarks familiar from our 2010 visit to Gdańsk, we followed the tram lines out to the mundane suburb of Stogi, turning off through grimy industrial back streets eventually to reach the gates of Stogi Camping close to Stogi Plaza beach area. The lad at reception welcomed us in typically unsmiling Polish manner, and we found a reasonably quiet corner pitch away from the crammed in camping-cars and caravans (see right). He gave us details of the #8 tram from Stogi Plaza into the city in readiness for tomorrow's visit to Gdańsk and its famous shipyards birthplace of the Solidarity trade union, and advised us that tram travel was free of charge for seniors. 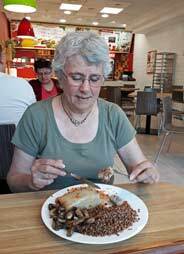 Facilities at Stogi were much improved since our 2010 stay, including site-wide included wi-fi albeit with weak signal. 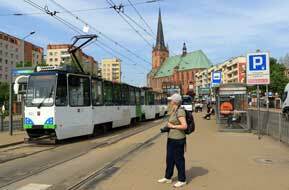 A day in the Hanseatic port-city of Gdańsk: in clear sunshine the following morning, we walked along to the Stogi Plaza tram stop for the 20 minute ride into Gdańsk Old Town for today's re-visit (see above left) (Photo 24 - Tram ride into Gdańsk). The major port-city of Gdańsk had developed as a leading member of the mercantile Hanseatic League with Poland's grain and timber trade channelled through its port. 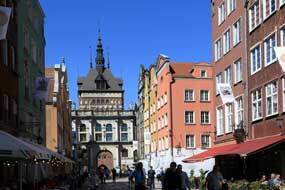 Merchants from across northern Europe were attracted to Gdańsk, and Flemish architects designed the tall gabled characteristic houses reflecting the city's confidence and prosperity. Following the late 18th century Partitioning of Poland, Gdańsk fell under Prussian control, and after Poland's 1918 recovery of independence, under the post-WW1 Versailles Treaty Gdańsk became the Free-City of Danzig acknowledging the city's predominantly German population; Poland's access to the Baltic was assured by its retention of the Polish Corridor which separated Germany from East Prussia (see map right), a source of outrage for Hitler and pretext for the 1939 invasion of Poland. 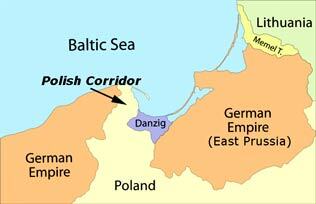 The first shots of WW2 were fired in Gdańsk with the German assault on the Polish garrison at Westerplatte. In 1945 the Red Army inflicted total devastation on Gdańsk, and after liberation the city was restored to Poland; the entire German population was expelled and the city repopulated with Poles repatriated from the Vilnius area of what became Soviet Lithuania. The devastated city has since been meticulously restored, so that today there is little evidence of wartime damage, and the city's traditional shipping and ship-building industries revitalised. In the communist era, the Gdańsk shipyards then known as the Lenin Shipyards became the focus of popular discontent and protest against food shortages and price increases during the 1970s~80s, leading to the formation of the eastern bloc's first independent trade union Solidarność (Solidarity) under their charismatic leader, shipyard electrician Lech Wałęsa (see above left). With free elections and post-communism governments, Gdańsk blossomed again profiting from the increase in tourism, but the shipyards which had been the focus of popular discontent contributing to the downfall of communism have declined in the face of Far East competition; they remain an emotive and powerful symbol of today's Poland with the Solidarity emblem seen everywhere albeit now more of a tourist attraction. The tram dropped us at Brama Wyżynna, the triumphal gateway emblazoned with the 3 coats of arms of Poland, Prussia and Gdańsk (see left), and we passed through the richly decorated inner gateway of Brama Złota (Golden Gate) (see below left) alongside the Gothic mansion of St George's Court, its turret topped with a statuette of the saint skewering his dragon. The Old Town's iconic main thoroughfare, ulica Długa (Long Street), opened out before us giving every appearance of a Hanseatic merchant city with its magnificently restored tall, slender Gothic-gabled town houses (see right) (Photo 25- Gdańsk Old Town main thoroughfare) (see right); some had Renaissance façades, and others beautiful later Art Nouveau decorated stucco with trompe l'oeil ornamentation. 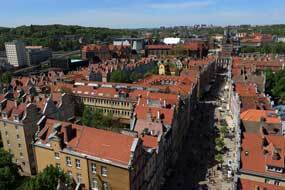 You could never have believed that central Gdańsk had been reduced to total devastation by Russian and Allied bombing in WW2, so thorough had been the post-war restoration. We ambled along the street, our eyes cast upwards admiring the magnificent detail of the houses' decorated Gothic frontages lit by the morning sunshine (see below right). The city Historical Museum in the Town Hall showed the lavishly decorated Renaissance council chambers and reconstructions of 1920~30s life in the Free City of Danzig. But our interest was to climb to the viewing-terrace of the Town Hall's lofty tower (Photo 26- Gdańsk Town Hall tower) (see below left)for the panoramic views over the Gdańsk skyline and Old Town's roof tops with their characteristic gable-topped façades (Photo 27- Gdańsk skyline) (see below right). The view northwards towards the shipyards cranes was partially blocked by the monumental bulk of St Mary's Church said to be the world's largest brick-built church. Descending the tower's winding stairs, we eventually found the display of photographs showing the extent of wartime bomb devastation to the city. Returning to ground level, we continued along to Długi Targ passing Gdańsk's famous Neptune Fountain and the backdrop of magnificently façaded Arthur's Court merchant's mansion and guild meeting house (Photo 28 - Neptune's Fountain and Arthur's Court). Tourists milled around street stalls selling amber jewellery and ice cream. Approaching the Brama Zielona (Green Gate) which spanned the far end of ulica Długa, the street was lined with more slender 4~5 storey high town houses, their frontages decorated with beautiful Art Nouveau stucco work. Beneath the gateway, a string quartet of young musicians played Vivaldi to entertain the tourists. Through onto the Most Zielona foot bridge spanning the Motława River, we walked along the waterside walk to photograph the river scape looking downstream towards the restored 15th century Żuraw (Crane) (Photo 29 - Motława river-scape), 2 towers of the city fortifications connected by a huge wooden structure extending out over the river, housing the lifting gear of the medieval crane used for unloading cargos from boats moored at the dockside and installing ship's masts. Along past the waterfront cafés, we turned back from the river along the narrow and meticulously restored ulica Mariacka, its high gabled-fronted houses now filled with amber jewellers (Photo 30 - Ulica Mariacka). The far end of the street was dominated by the bulky mass of the Marian Church, the basilica now undergoing further restoration. We returned along ulica Długa to the Brama Wyżynna tram station to catch the #8 tram northwards to Plac Solidarnośći to re-visit the Gdańsk shipyards. Having spent the first part of our day following the Gdańsk tourist trail, we wanted to devote time to exploring the historic shipyards and their association with Solidarity and the period of industrial protests which led ultimately to the downfall of communism and emergence of the new democratic Poland in 1991. Plac Solidarnośći (Solidarity Square) stands next to the original Shipyard Gate Number 2 where in 1980 a young shipyard electrician, Lech Wałęsa, had made the historic announcement of the official recognition of Solidarity as a trade union independent of Party control. 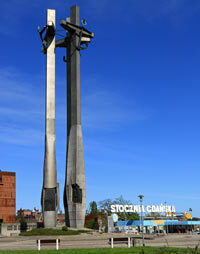 Towering over the square, 3 enormous steel crosses, the Memorial to the Fallen Shipyard Workers, commemorate the dozen demonstrating protesters killed in 1970 when the dreaded ZOMO riot police opened fire on strikers protesting against increased food prices and wage cuts as the incompetent communist regime struggled to contain the mismanaged Polish economy. Throughout the 1980s, the shipyards remained in the forefront of political protest. The final strikes of 1989 led to the Round Table Talks which forced the communists into power-sharing and led eventually to the first democratic elections and downfall of communism. Wreathes laid on Monday's Labour Day parade still stood at the foot of the monument (see left) (Photo 31 - Gdańsk Shipyard Gate and May Day wreathes); the shipyard wall alongside the square was lined with memorial plaques to the killed protesters, and a tablet recorded the famous 21 Demands of the 1980s strikers at the time of Solidarity's recognition. We had in 2010 visited the then free entry Solidarity exhibition which was then housed in a modest brick building just inside the shipyard gates. 8 years later, this had been replaced with a huge and pretentious exhibition hall faced with rusting steel ship's plates. We ventured inside, but not prepared to pay the Solidarity exhibition's now expensive entry price, we took the lift up to the roof-top viewing platform for the panorama over what remained of the Gdańsk shipyards, their cranes towering over the city-scape (see right) (Photo 32- Gdańsk shipyards cranes). Through the dockyard gate, we walked over to one section of the surviving shipyards, now much reduced in scale in harsher 21st century economic climate from their 1970~80s heyday. Back to Plac Solidarnośći, we waited for the next tram back to Brama Wyżynna, and walked through to ulica Długa for an early evening beer at one of bar-terraces as the sun dipped behind the tall gable-fronted façades. It had been a thoroughly enjoyable day in the port-city of Gdańsk, impressively restored to its Hanseatic glory after wartime destruction, and now clearly a popular tourist venue with both visiting Poles and youngsters jetting in from Western Europe to behave badly in the city's bars. The Wiślana Sandspit: with the sunny weather forecast to last another week, we joined Route 7 eastwards in furious Warsaw-bound traffic and were relieved to turn off to shop for provisions at a Biedronka supermarket (meaning ladybird - see left) in Novy Dwór (click here for detailed map of route). Heading north across the flat farm lands of the Wiśla estuary towards the Baltic coast, we turned eastwards through the resort-village of Stegna and just beyond Kąty Rybackie joined the Wiślana sand-spit. The Wiślana sand-spit peninsula extends for some 90 kms enclosing the lagoon-delta of Wiśla River on its southern side, and divided at the halfway point by the sealed border with the Russian Oblast of Kaliningrad (see map right). With much city-bound traffic returning westwards to Gdańsk after a holiday weekend, there were few cars travelling east, hopefully meaning a peaceful couple of days out at the tiny, isolated Polish settlement of Piaski just before the border. It was a delightful drive with the sun streaming down through the tree-covered sand-spit lighting the bright green new leaf. We reached Krynica Morskie now an even more developed beach-resort than when we were last here 7 years ago, with new blocks of holiday apartments. Continuing eastwards along the spit, the lane became more narrow, with just a few cars parked by remote wild Baltic beaches beyond the trees. The road wound its peaceful way through the glorious woodland, finally reaching the outskirts of Piaski. 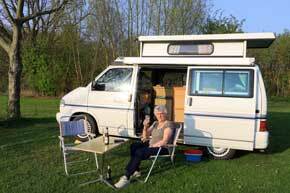 Piaski Camping: we pulled into the driveway of Piaski Camping, and a brief heart-sink moment - the gate was closed. 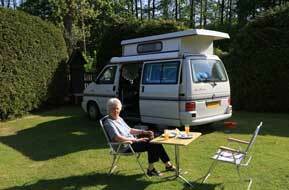 But the German-speaking elderly owner welcomed us, and we selected a pitch in the deserted campsite over by the lagoon. 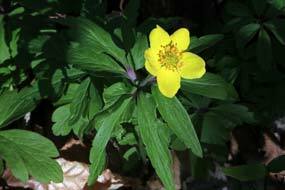 The scented wild roses recalled from our previous stay were of course not yet in bloom, but the frogs still sang in happy antiphonal chorus from the reed-covered lagoon. 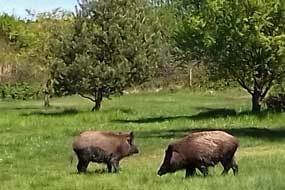 The song of this year's first cuckoo resounded insistently across the marshes, and a pair of Piaski's wild boars with flock of stripy piglets scampered by to welcome us back to Piaski Camping (see above left). The peacefulness of this delightfully straightforward campsite, a little bit of heaven on earth, was tangible. 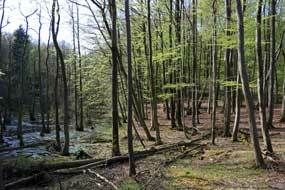 A walk through the Piaski forests to the sealed Polish~Kaliningrad border: having settled the camper in, we set off for this afternoon's planned walk along through the forests to Poland's eastern border-fence with Kaliningrad-Russia. At the far end of the village, we turned uphill over the steep brow of the spit, from where we followed the path through the deserted forests for 3kms towards the sealed border. Sunlight filtered down through the trees, an attractive mix of tall, dark pines and bright green leaves of birch, beech and rowan. 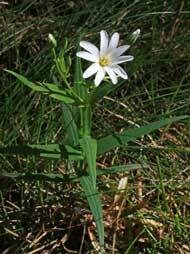 Butterflies flitted among the ground cover of Bilberry, May Lilies just breaking into leaf, beautiful Wood Sorrel (Photo 33 - Wood Sorrel), and white Greater Stitchwort flowers (see above right). The path wound its way through the peaceful woods along the crest of the spit, and towards the border-fence a Polish border surveillance tower rose above the trees. Reaching the fence, we dropped down to a boundary gate into the 500m wide forbidden-access border-zone with familiar White Eagle Polish national emblem marking the end of EU territory, and followed the fence-line over the dunes, down onto the deserted white sand beach of the Baltic shoreline. The border fence continued down the sloping sands, extending into the sea where the gentle Baltic surf lapped around its footings, and a 'Stop' sign reinforced the barrier (see right) (Photo 34 - Kaliningrad-Russia border fence). 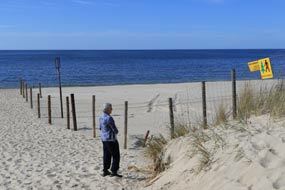 The white sand beach on the Polish side of the fence was disturbed by visitors' footprints; in contrast the only marks beyond the fence towards Russian territory on the otherwise undisturbed sand were the occasional tracks of birds (see right). Despite the bright sunlight, it was an eerie setting, particularly with Western relations with Putin's Russia at an all time low. We set off back along the trackway through the lower pine forests, with the stark outline of the tall trees silhouetted against the light of the western sky. A delightful day in camp at Piaski Camping: the peaceful setting of Piaski Camping was perfect for our much needed day in camp, with just the happily singing marsh frogs from the lagoon for company. The warm sun filtering through the trees lining the reeds of the lagoon gave us dappled shade (Photo 35 - Piaski Camping) (see left). 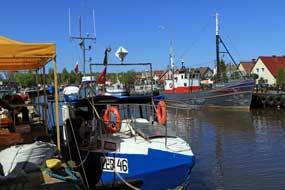 We completed our day's work at 5-15pm and walked along to Piaski's little lagoon harbour for photos of the boats and fishing equipment and nets (Photo 36 - Piaski harbour). Looking out through the reeds, the spires of Frombork Cathedral were silhouetted on the distant southern horizon across the wide lagoon (Photo 37 - Distant Frombork Cathedral). Despite the golden light of the declining sun, a chill northerly breeze blew over the brow of the spit from the Baltic Sea. Before returning to camp, we stopped off for an evening beer at Piaski's little bar-shop (see right), and as dusk settled over the village, we lit the barbecue for supper of grilled smoked Baltic cod. Today had been a perfect day in camp: the May-time weather had been benign with warm sun and cooling breeze, the frogs had croaked their comical songs in the lagoon marshes all day with the cuckoo calling over the reeds, and the straightforward and peaceful campsite had lived up to all our recollections; it had been a memorable stay. Piaski must go down on record as yet another of our Very Special Places. But the elderly owner now seemed to be on his own, and the place was clearly getting rather run-down; perhaps if we ever to return, Piaski Camping would either be closed or changed from its present charmingly straightforward character. Stutthof concentration camp: the following morning, we drove back over the brow of the spit down to the Baltic beach side parking area. The calm Baltic Sea was blue this morning reflecting the clear sky, with a couple of fishing boats drawn up on the beach line, deserted in both directions as far as the eye could see; this was the Baltic we come so far to find (Photo 38 - Baltic beach at Piaski) . Finally leaving Piaski, we returned along the winding lane through the sand-sp into the garish world of developed beach-resort. Over the spit brow at the beach, where in 2011 fishing boats were drawn up on the beach, and we were able to buy freshly caught flądra from fisher-folk sorting their morning catch, today the boats were gone and sordid holiday-apartment developments increasingly encroached. Today in mid-May the beach-side car parks were largely empty and cafés closed; in mid-summer they would be crammed full and beach filled with obese holiday-makers. There was nothing to detain us here; we continued our drive back along the spit and at the coastal village of Szututowo we turned into the memorial site of what from 1939~45 was the Stutthof concentration camp. Immediately following the German invasion of Poland on 1 September 1939, massive roundups began of Poles who were active in social, economic or political life; the population of the free-city of Danzig was predominantly German and lists of members of Polish cultural or nationalist organisations had been pre-assembled in readiness for the invasion. 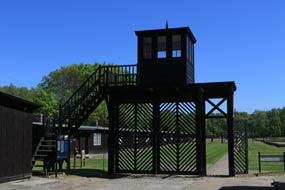 In early September 1939, the first transports of Polish political prisoners arrived at Stutthof; the forced labour and extermination camp served the German purpose of eradicating all Polish intelligentsia. In 1944 the camp was enlarged to become another mass extermination centre contributing to the 'Final Solution to the Jewish Question'. 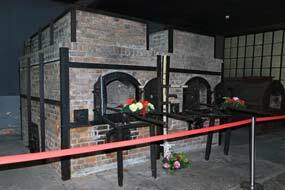 In total 110,000 victims were imprisoned at Stutthof from all across Northern Europe of which 85,000 were murdered by physical exhaustion from slave labour, malnutrition, brutality, or infectious disease caused by overcrowding and insanitary conditions. We entered the Gate of Death into the now empty camp complex (Photo 39 - Stutthof Gate of Death) (see left) surroundd by once electrified barbed wire, where now 3 of the surviving huts housed museum displays on the camp's history and prisoners' appalling living conditions (see right). Initially detainees were Polish political prisoners, but as the war advanced Jewish prisoners were transported to Stutthof in cattle trucks from all around Europe on the narrow gauge railway which still runs alongside the camp. Stutthof was the core of an entire network of sub-camps all across Pomerania where prisoners worked and German industrial concerns with names well known in the modern world exploited and profited from the forced slave-labour. 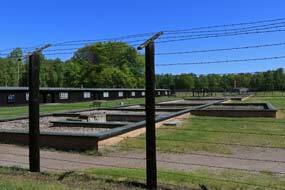 At the far end of the electrified barbed-wire compound, we found the gas chamber and crematorium (see left) (Photo 40 - Gas chamber and crematorium), small in size compared with the industrial scale mass murder factories at death camps like Auschwitz. Here further displays showed the horrors and deaths resulting from the forced march westward evacuation of the camp in May 1945 as the Red Army encircled Stutthof. Gratifyingly after the war, the Polish authorities tried a number of SS guards and kapos and many of those responsible for these crimes against humanity were executed including the camp commandant. Alongside the modern memorial was inscribed with the words If man should grow silent, the very stones would cry out; perhaps the stones should indeed cry out to ensure that future generations do remember German barbarity and the sufferings inflicted on so many millions. Copernicus' Cathedral at Frombork: back across the flatlands of the Wiśla estuary, we re-joined Route 7 towards Elbląg amid a confusion of speeding Polish traffic and road development works. Thankful to turn off through Elbląg's northern outskirts, we turned off onto Route 504 towards Frombork the small Baltic lagoon port of Frombork (click here for detailed map of route). This was another poorly surfaced, pot-holed winding minor road, meaning slow progress. Reaching Frombork, we found parking up on Cathedral Hill where the mighty red-brick fortification walls of the town's 14th century Gothic Cathedral complex reared up like a medieval castle high on a hilltop. Frombork's chief claim to fame however is that Nicolaus Copernicus (Mikołaj Kopernik in Polish) (see right), the medieval astronomer and arch-Renaissance-man, spent the later 30 years of his life as a canon of the Frombork Cathedral chapter. It was here that he conducted the empirical research which led to the publication of his seminal treatise de Revolutionibus Orbium Caelestium (On the Revolutions of the Heavenly Spheres) which refuted the church-approved Ptolemaic assumption that the sun revolved around the earth. 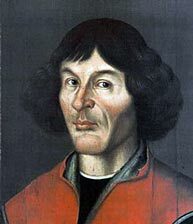 Copernicus incurred papal displeasure with his assertion that in fact the sun was the centre of the solar system, with the earth and other planets following circular orbits around it. 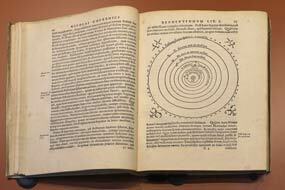 His work on the heliocentric solar system inevitably was banned by the Catholic church and was eagerly published by Lutheran printers in Nuremberg in 1543, the year of Copernicus' death. We made first for the belfry tower in the Cathedral courtyard's SW corner while the afternoon light was still good for the views from the tower's viewing platform. 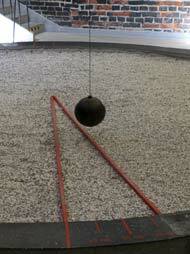 A Foucault Pendulum was suspended inside the tower's 28m height, a reproduction of the experimental apparatus devised by the mid-19th century astronomer Léon Foucault to demonstrate the earth's rotation. Suspended high above the earth's surface, the pendulum continues to swing along the same plane of oscillation relative to the earth rotating beneath it; at latitudes other than the equator, the effect of the earth's rotation causes the angle of the pendulum's fixed plane of oscillation apparently to change. The attendant set the heavy pendulum swinging, and in the 15 minutes it took us to climb the tower, the plane of the pendulum's swing appeared visibly to have moved a few degrees on the scale of sector of markings relative to the earth rotating beneath it (see left). The tower's viewing platform gave a magnificent vista onto the Cathedral's ornamental red-brick Gothic turreted structure (Photo 41 - Frombork Cathedral) (see above left). Across the tree-filled Cathedral close, the Warmia Bishop's Palace at Frombork now houses a museum on the life and work of Copernicus, displaying a selection of the polymath's astronomical, medical, architectural and political writings, including a 1566 edition of his treatise de Revolutionibus Orbium Caelestium demonstrating the heliocentric solar system with the planets orbiting around the sun against a firmament of fixed stars (Photo 42 - Copernicus' treatise de Revolutionibus Orbium Caelestium) (see above right). Elbląg Camping: from Frombork, the even more pot-holed Route 505 brought us across country to join the highway standard Route 22, the principal road leading into Kaliningrad-Russia from Poland, and at motorway speed we returned to Elbląg for a night at the delightfully welcoming, small canal-side Elbląg Camping, always highly rated on our 2 previous stays. Turning into the town, we found the E Leclerk supermarket (totally surrealistic - were we in France or Poland?) to re-stock with provisions. Through the town centre amid busy early evening traffic and trams, we turned off around back streets one-way system to reach the campsite. 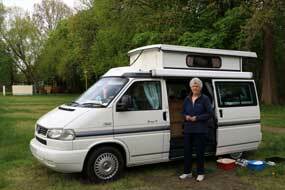 We were again welcomed by the German-speaking elderly owner, and even at this early stage of the year, the site was quite busy mainly with German tourists who monopolised all the canal-side pitches. We pitched well away from the monster camping-cars in a quiet corner on the far side, but the price of isolation was being closer to the noise of city traffic. Facility standards were as good as ever with a particularly well-equipped kitchen/wash-up, and the price was a remarkably good value 50 Złotys/night (£10) including camping card reduction, probably the best all round value of the trip. The sun sank below the high trees but the evening air remained comfortably warm (see right). A long drive through rural North Poland, circumventing Kaliningrad: a sunny morning for today's long, multi-part drive on rural back roads through NE Poland, circumventing Kaliningrad. The first stage was a speedy return north from Elbląg on the Route 22 highway to the final exit before the Kaliningrad border-crossing (click here for detailed map of route). In contrast on joining Route 507, we suddenly faced a single-track, poorly surfaced, winding lane for the next 25kms to the large village of Pienięźno. This hidden corner of NE Poland's borderlands felt eerily remote, passing through impoverished-looking villages with blocks of communist era apartments and run-down farms. Beyond Pienięźno, we bumped along an even more narrow and pot-holed lane for a further 25kms to reach the attractive little town of Górowo Iławeckie where we parked in the cobbled square to buy today's bread at the local piekarnia (bakers). 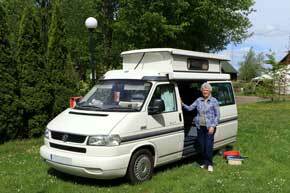 A further 25kms on the better surfaced Route 512 brought us to the larger town of Bartoszyce. 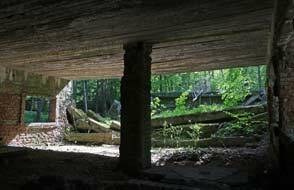 The Wolf's Lair, Hitler's WW2 military HQ in East Prussia: turning onto the wider and well-surface Route 592 for a further 43kms, we made better progress to reach Kętrzyn, formerly Rastenburg under German East Prussia. 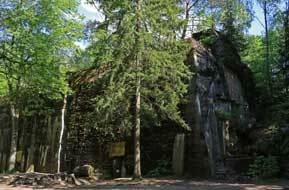 On the far side of the town we turned off on a minor lane to find the Wolfsschanze (Wolf's Lair), Hitler's WW2 military HQ hidden away in the forests where he skulked for over 3 years, conducting the eastern front war until his final withdrawal in late 1944. The complex with its own airfield and railway station occupied some 2.5 square miles surrounded by security zones and guarded by huge numbers of security troops. The central bunkers accommodated Hitler's entourage of cronies, Göring, Bormann, Himmler, Speer, Ribbentrop and military leaders Keitel and Jodl. As the Red Army approached, tons of explosives were used in an attempt to destroy the complex; the 8m thick steel-reinforced concrete bunker walls, though badly damaged, were left almost intact (see left). The minefields surrounding the complex were so extensive that it took until 1956 finally to clear them with some 55,000 mines defused or detonated by Polish mine clearance troops. This sobering site now attracts coach loads of German tourists who flock here to see where their erstwhile führer conducted the war which cost so many lives and so much suffering. Despite the fact that this dreadful place reeked of evil, we like others were drawn by here salacious curiosity and followed the route around the complex, peering into the ruined and now decaying reinforced concrete bunkers (see left). Inevitably the monumental bunker occupied by Hitler attracted most attention (see right): the northern side was almost intact but the rear was in total ruins from the 1944 attempts to destroy the complex, with broken slabs of massive concrete and projecting steel reinforcing bars. 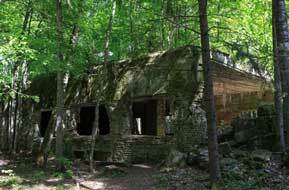 One of the most poignant sites at the Wolf's Lair were the ruined remains of the conference room where in July 1944 von Stauffenberg's briefcase bomb had come within an ace of assassinating Hitler (Photo 43 - Wolf's Lair). From 1942, failures on the eastern front and the appalling atrocities and genocide committed in occupied territories had alienated aristocratic high ranking German army officers; as the war turned against Germany, a plot was formed to assassinate Hitler and sue for peace with the Allies. Von Stauffenberg had access to the Führer HQ and used the opportunity of a military briefing with Hitler to place his briefcase bomb by the leg of the conference table. Unfortunately another officer moved the briefcase beyond the heavy table leg and although the explosion wrecked the building killing others, Hitler was unwounded. Von Stauffenberg escaped by plane to Berlin but the plot was doomed; in a viciously ruthless roundup, von Stauffenberg and 5,000 others were executed, in the process eliminating many who might have been qualified to run the post-war German government. Had the plot succeeded, the outcome of the war and European history might have been so different: 5 million lives might have been spared, the devastation to Poland avoided along with communist control of Eastern Europe. As it was, Hitler became even more paranoid in his conduct of the failing eastern campaign and the war ground on to its destructive conclusion with Stalin overrunning the whole of Eastern Europe. Garden Camping at the Jurand Inn at Gołdap: our onward route to Gołdap for our final night in Poland took us on minor back roads past the bunkers of the Mauerwald HQ of the Wehrmacht high command for the eastern front war following the 1941 invasion of USSR. The lane led through lovely rural villages and farming countryside had been tarmaced since we had last passed this way in 2010. Through the Mauerwald Forests, we began to get views across the Masurian Lakes of NE Poland and passed the Masurian Canal built by the Prussians in 1911 to connect Lake Mamry via a series of rivers and lakes with Konigsberg (Kaliningrad) with 10 huge locks to overcome the 100m height difference between the inland lakes and the Baltic coast, which we had visited in 2010. 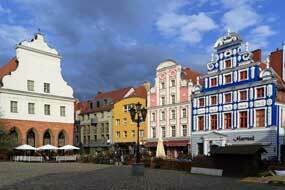 Through the unremarkable town of Węgorzewo, we joined Route 650 to the larger town of Gołdap. On our visit here in 2011, we had by chance found the Jurand Inn (Zajazd), where the hospitable owner had allowed us to camp in the lawned gardens. 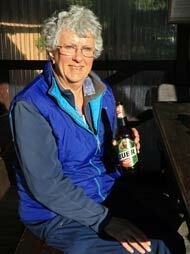 We hoped to camp there again tonight and earlier had telephoned and received a welcoming response. Reaching Gołdap we found the inn with its familiar maroon stucco mock half-timbered frontage, to be greeted in hesitant English by the ebullient owner who again directed us onto the garden lawns; it was a lovely welcome again after today's long and tiring journey. The following morning after breakfast out on the Jurand Inn's lawns (see left) (Photo 44 - Jurand Inn at Gołdap), we used the last of our Polish Złotys to settle our bill, amid more the owner's jovial banter as he asked us about our journey around the Baltic and welcomed us back. 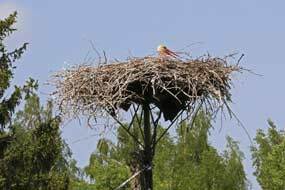 Storks nesting in the farming hamlets of NE Poland's borderlands: leaving Gołdap, we set off on the final stage of our journey on the delightful Route 651 through NE Poland's borderlands of former East Prussia (click here for detailed map of route). First stop this morning was just before the village of Dubeninki at a WW1 East Prussian war cemetery with both German graves with imperial German crosses and Tsarist Russian graves surmounted by Orthodox two-barred crosses. The sturdily built stone walls reflected the Teutonic character of the East Prussians. It was at Dubeninki in 2011 that we had witnessed the Corpus Christi Day parade as locals processed with hymn singing and banners behind their priest for the blessing of shrines decked with flowers and birch branches; no such festivity today in this work-a-day farming village, but we stopped to photograph storks' nests on power poles and chimney tops, with adult birds incubating eggs (Photo 45 - Nesting storks) (see left and right). Today's journey through farming hamlets gave much opportunity for pausing on a quiet lane to photograph storks both sitting or standing on nests, foraging in the fields or soaring around . The former Prussian railway viaducts at Stańczyki: a few kms further and we turned off over wooded hilly country to find another local curiosity near the hamlet of Stańczyki, 2 massive railway viaducts dating from the early 20th century German control of East Prussia. 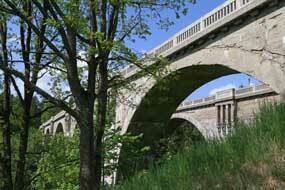 The viaducts, standing side by side and built of cast reinforced concrete, 200m long with five 36m high arches, each supported a single railway line and spanned the wide Błędzianka valley (Photo 46 - Stańczyki railway viaducts) (see left and right). Stańczyki had been located on the border of East Prussia and Poland, and in 1910 the Germans had constructed a railway line to transport timber; a second viaduct was built later to cope with increased freight and timber traffic, but the Gołdap~Źytkiejmy line fell into disuse before WW2. 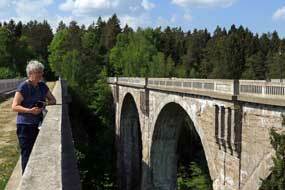 The twin viaducts survive towering impressively above the valley, but the railway lines have long gone along with East Prussia. At the top of a dusty track, access to the embankment leading to the viaducts costs 3 Złotys but €2 was readily accepted for us cross the viaducts, stand by the viaduct's balustrading to examine the huge cast concrete arches forming the spans, and clamber down to their base. The sealed border with Kaliningrad at Żytkiejmy village : a short distance further brought us to the village of Żytkiejmy. Here we photographed more nesting storks and heard this year's first bill clattering ritual, and followed a narrow lane which the map showed leading to the sealed Kaliningrad border. Dogs barked and cattle lowed as if to say 'Don't go down there'. 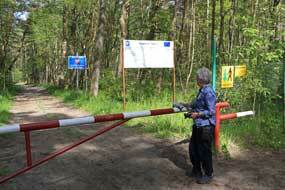 But we did, and 400m along, the lane was completely blocked by locked gate and barbed wire fencing on the Russian side. By the Polish Granica Państwa (national border) sign, the red and white Polish border marker faced the maroon and green Russian past up on an embankment (Photo 47 - Sealed Kaliningrad border). This was without question a 'No through road' with nothing but inhospitable forest on the Russian side. We took our photos at this eerie spot where 2 alienated worlds collided, and retreated safely into Poland before we provoked a border incident. The Three Borders Monument at meeting point of Poland, Lithuania and Kaliningrad-Russia: our final stop in NE Poland was at the Three Borders Monument (Trójstyk Granic), the politico-geographical point where the borders of the 3 countries, Poland, Lithuania and Russian Oblast of Kaliningrad meet (see left) (Photo 48 - Three Borders Monument). 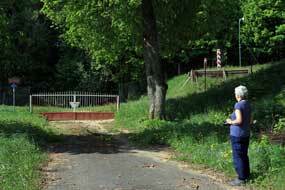 Since our last visit in 2011, the EU had funded construction of a parking area and tarmaced pathway alongside the Polish~Lithuanian border fence-line leading up to marble obelisk marking the three borders meeting point. Formidable fencing topped by coils of razor wire separated with Lithuanian/Russian border; given strained West~East relations resulting from Russia's unacceptable international conduct, Lithuania's antipathy towards Putin's Russia was understandable. Crossing the border into Lithuania: we drove on for the 7kms down to the outskirts of Wiźayny village, and just before turned off onto a back lane which we knew would lead us to our favourite obscure 'back door' crossing into Lithuania. Here by the border sign we paused for photographs of our entry into this year's 4th country, and first of the three Baltic Republics, Lithuania. We had since leaving Hook of Holland travelled a total of 1,485 miles (380 miles to Lübeck, and a further 1,105 to the Lithuanian border). Tomorrow we should begin our circuit of travels within Lithuania, but that's the story for the next episode which will follow shortly.